Hi, everyone. 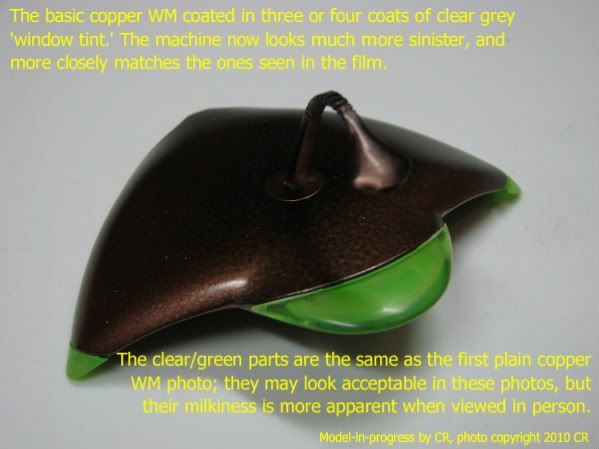 This is actually old news, but Pegasus Models has released some plastic model kits of the Martian War Machines from the 1953 WotW film. 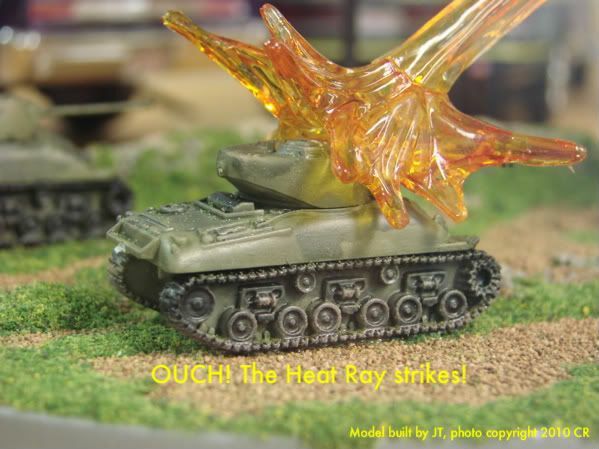 One is a 1/48 scale model of the 'manta ray' machine, and the other is a 1/144 scale diorama kit featuring a landscape base, two war machines, two US Sherman tanks & a plastic 'heat ray' piece to 'shoot' one of the tanks. There are deluxe versions of each kit, pre-painted (finished in a shiny 'chrome plate' copper) and much more expensive. I received the standard version (unassembled & unpainted) of the diorama kit for my birthday over a year ago, and am finally getting around to building it. It goes together ridiculously easily, so little to no model building experience is required. I, of course, can't leave well enough alone, and am expanding the model to include three war machines and an extra Earth vehicle, a halftrack. The halftrack is modified from a model-quality toy, with me adding a rocket launcher assembly. 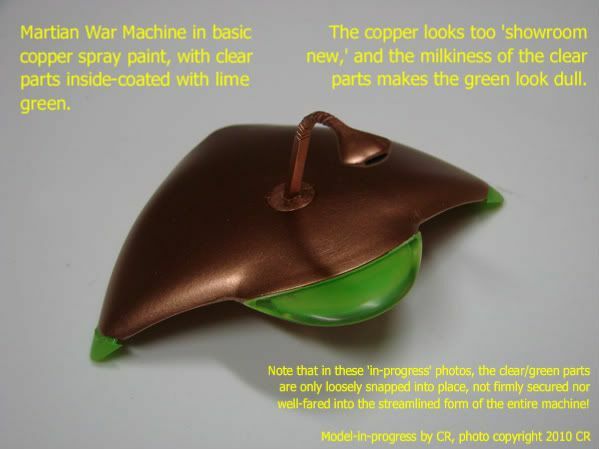 I'm finishing the Martian war machines in a standard spray paint copper finish, as it better resembles the 'weathered' look in the film, rather than a 'show-room new' shininess that the deluxe kits have. I'm also binning the single solid plastic sticks for each war machine (engineered to get stuck right into each machine's underside) in favour of making a 'tripod' for each machine out of clear acrylic rods. I hope to somehow simulate a sparking effect on the ground where each 'leg' makes contact, like in the movie. Anyway, that diorama will be a long time in coming, but if anyone else out there has a notion to try it, I'd love to see what you come up with! 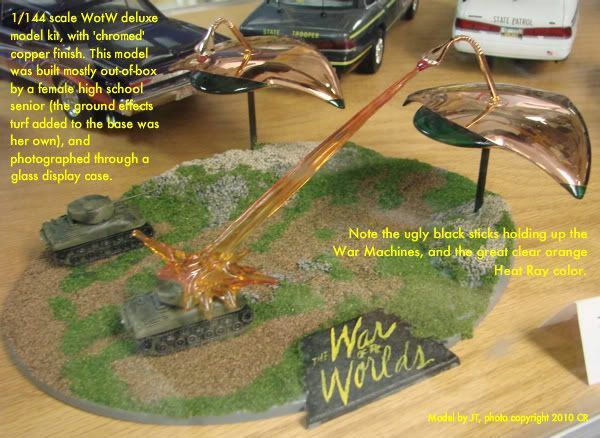 Anyway, I just mentioned on the LIFEFORCE shuttle thread: "On the other hand, I am currently working on a WotW diorama based on the 'US Marines versus the Martians' battle from the 1950's film." This is the 1/144 scale stuff I mentioned earlier. I've got three War Machines completed, and had hoped to post some pics, but can't find my camera's USB cable. I've not yet painted the Heat Ray parts, as nobody seems to manufacture a translucent orange. There's translucent red (which works for the War Machines' Heat Ray 'eyes'), but no orange for the beam. Perhaps I'll have to custom mix something & shoot it through an airbrush... which means buying an airbrush someday... I digress. Another option is to lightly 'dust' a coat of orange paint over the milky-clear Heat Ray parts, so that they still have some translucence to them. Yeah, I think I'll go that route! 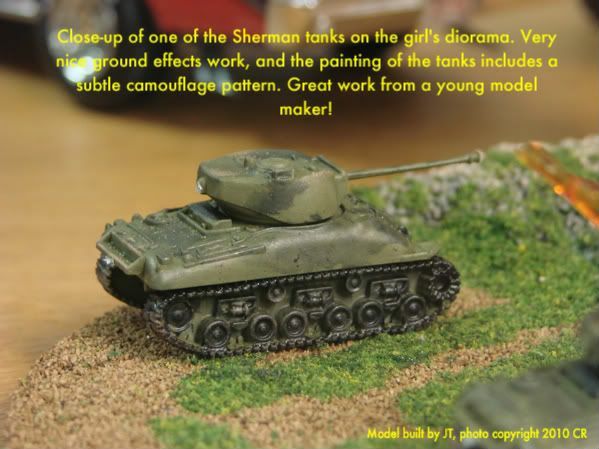 As for the Earth stuff, the Sherman tanks area built out-of-box. I added a 1/144 scale toy of a US halftrack, cutting off a large peg from its bottom (used to secure it to its display case) and scratch built a rocket launcher assembly & mounting rack. Careful viewing of the movie has me thinking that the rocket launchers were actually mounted on the scout car variation of the real vehicle, rather than the halftrack, but I want to finish this diorama soon, and don't wish to take more time converting the toy. (I'd have to remove the track parts, shorten the back end and add a set of wheels where the tracks had been; not easy on the toy, since it's some type of soft plastic or vinyl, rather than styrene.) I'm going to find some US troops in that scale and have them running & getting zapped. I shall post pics of the War Machines and the built but as-yet-unpainted Earth vehicles as soon as I find my USB cable. Stay tuned! EDITED TO ADD: 'Another QUICK update'? This is my longest entry yet on this thread! Hi Craigr. As you probably guessed I've not been here for some time. I've only just found this thread. By a strange coincidence I stumbled across the War Machine model kits about a week ago and at the time I thought they looked way too shiny, you do right to build your own and paint them duller. looking forward to seeing the photos.... when you've found that USB cable. I've been doing a little model work myself these last couple of months. It's of a British comic book character called 'Nemesis The Warlock' You're forgiven if you've never heard of him, as I said he's from a Brit comic called 2000ad, I don't know if it's even sold in the USA. You should pop over and join us, there are several of the old gang from this site over there, plus it's not just a WotWs site, it's Sci/Fi in general. I'll keep an eye on this site to see if you ever found that Cable. Well, I found the cable, but when I tried to connect to the Mac I'm currently using, I had no joy. A different Mac I used in the past worked OK, and of course long ago, all the stuff I uploaded to post here (my sons' paper tripods, drawings, the Churchill) worked just fine on my now-dead PC. Ah, well, I'll keep trying. If nothing else, I'll get a photo cd made at a local store & see if I can transfer stuff from that. Check back in a week. Thanks for those links; I'll check them out when I have a bit of time (like right after I post). I have heard of 2000 AD, by the way, though I've not actually read it, and thus am not familiar with the characters. Though I'm no expert on all things British, I have had more exposure than most people I know on this side of the pond, since I've been interested in British sci-fi pretty much most of my life. Early influences include Gerry Anderson fare like Thunderbirds (the real one with Supermarionation, not the recent American live action version), UFO, Doppelganger (or Journey to the Far Side of the Sun as it's called over here; watching it as a very young child is one of my earliest conscious memories), and Space: 1999 (personal favourite). Another film I enjoyed in my youth was Quatermass and the Pit, though it was titled Five Million Years to Earth over here. I even liked Gorgo, the non-Japanese Godzilla-like monster that trashed London in search of her baby. Oh, and the Hammer horror films with Peter Cushing & Christopher Lee... I used to watch those when the local TV station had Halloween horror marathons after school. (I doubt such things would pass muster nowadays for school age viewing!) Of course, War of the Worlds has always been one of my favourite books, and the 1953 movie still remains a classic in my collection. I know, I know, the movie is American, but it's based upon the book. And the various comic adaptations of the book published in the 70's (and earlier, in the case of the Classics Illustrated version) all retold the original story set in England. I also hang out around British fora (like this one for example), though nowhere near as often as I used to. Nevertheless, I will often be exposed to 'new' things as a result, the likes of which many Americans have never imagined existed. So much for not loading this thread with extra stuff. Sorry, but I like to talk, and you inadvertently opened a floodgate there. Off I go to check those links! The sculpt alone was great, and the pose incredibly dynamic. And those eyes, very realistic. I love how you grafted the eye sections into the face, and cringed while I was reading/scrolling... so glad that it turned out OK! Glad you liked the Nemesis sculptures, thanks for the comments. Does your camera use a memory card such as a SD Card? and do you have a card reader built into your PC? I'm sure you've already though of this. I'm on a Mac, as I mentioned, and one with not very much memory left for anything. Somewhere, I have a software CD for my camera, which I hope I can install to the Mac so that it can recognise the camera, but the CD went missing during a move and/or a flood we had two years ago. LOL! That's exactly the one! Very nice work, especially given her age! This is taking me far too long; these four pics took about three times as long as on my old PC, and I have other things to do today, so I must log off for now. Sorry to only tease you with these images, but I shall upload more as time allows during the week. Remember that my model is a work in progress, and only the War Machines are completed at this point; the Earth vehicles need to be painted, and the diorama base has not yet been started. Check back later in the week for more War Machine pics! I agree, the copper/Chrome effect is far too shiny, I would be tempted to airbrush some sooty streaks over it. Yours has an eggshell like texture to it, that might give an interesting finish. But only one picture of your work I'm champing at the bit here I need more. The 'eggshell' texture is a result of using a spray 'rattle can' for painting, as opposed to an airbrush with which I could control air pressure & paint volume. 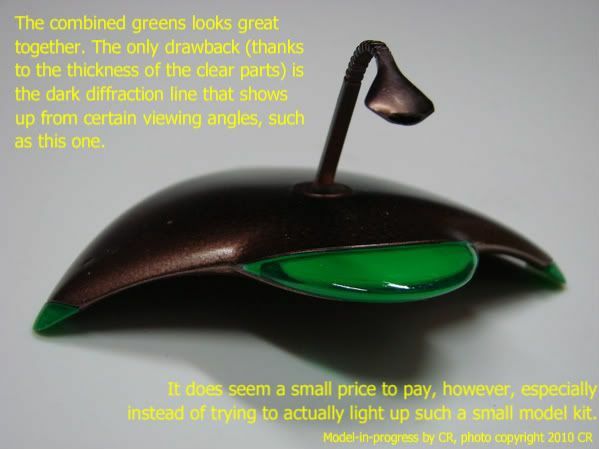 Of course, the model's small size, plus the zooming in with the camera, enhances any flaws about a zillion-fold. I just realised that the eggshell texture may be a contributing factor to the 'crazing' of the tint overcoats I applied later. Interesting, and thanks for helping me see what should have been obvious. I should be able to upload a few more War Machine progress pics later today. Next week, I hope to have some of the Earth vehicles... I made a mistake in my last post when I said the WM pics would be next week. Crazing is usually caused by incompatibility between two different types of paint, an effect that can be very useful in the right place. And I know what you mean about the camera zoom blowing up any imperfections. With my Nemesis sculpture I was happy with the paint job I had done until I looked at the photos I'd taken with the camera set on macro, then every little flaw looked like the surface of the moon, now I wear a jeweller's loop whilst painting, it makes the model look 2.5X larger. As for the paints, they are both spray enamels, Testors copper & Model Master grey window tint. I wonder, though, if the tint is chemically different. I knew a guy who sprayed a nicely painted model of a German tank with Testor's Dullcoat to tone down some not-so-flat bits of colour & to help seal the decals in place. The paint job fogged up, looking like a translucent coat of white glue had dried on it in places. (Necessity being the mother of invention, he hid the bad parts with some camouflage netting draped over the tank.) He contacted Testors, who admitted that there was a bad batch of Dullcoat that they knew about... I guess they sent him some new paint cans, free of charge, to make up for it. Oh, well... I'll stick with what I've got, hoping that 'studio miniature' purists don't mind the effect. Now if my Earth vehicles look weird, I'll try to fix that! Last edited by craigr on Wed Oct 20, 2010 7:28 pm, edited 1 time in total. No problem. Don't rush it. 24 hours is usually enough between coats. That's what I thought. 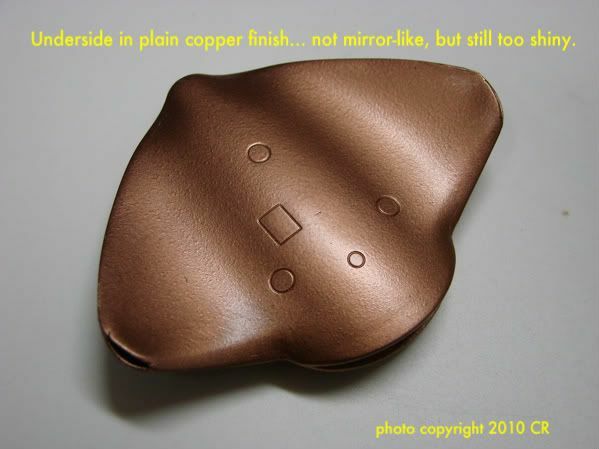 I do think that the 'eggshelling' texture of the sprayed-on copper must be part of the problem. 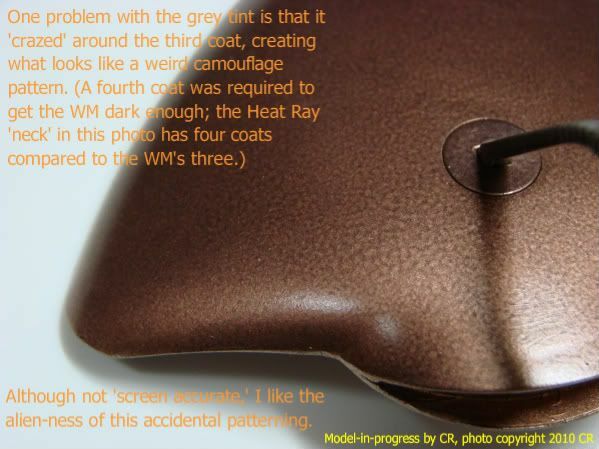 Interestingly, the clear grey tint is said to work best on clear parts (duh!) and on metallic paints. So... I got some more pics now. Want to see? Each pic has its own captions, so off we go! 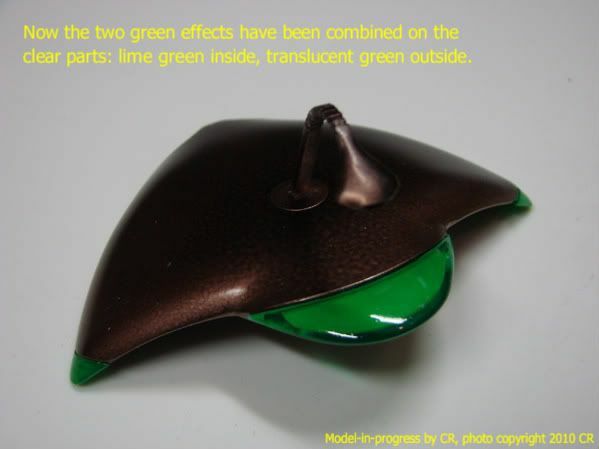 Honestly, the inside-coated lime green doesn't look bad as far as its 'brightness' goes; it does appear to closely match the studio miniatures' lighted areas. But I do prefer the combined greens to help get rid of the clear parts' dullness or milkiness; once again, they look a little better in person. Had to switch to orange text on this one, as the yellow didn't show up very well against the background. Well, I hope you liked these, and find them educational as well as entertaining. See you next week! I also like the dark camouflage pattern, one of those serendipitous moments. Are the clear parts colourless to start with? 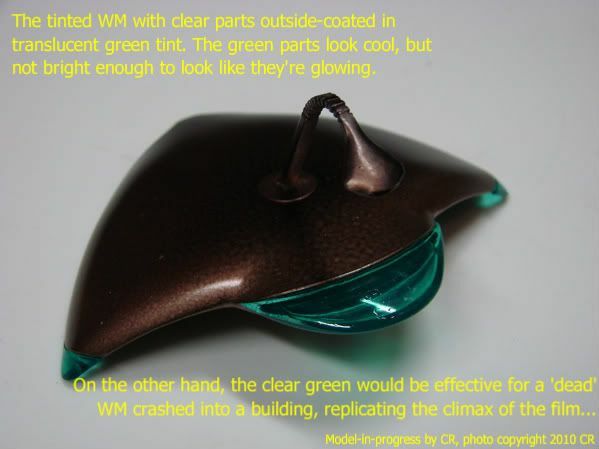 I imagined they were already tinted green. I quite like the dark diffraction line between the inner and outer surfaces of the clear parts, it look as though it's glowing inside. The green parts in the standard kit are initially clear, though not crystal clear; they have a slight 'milky' or 'cloudy' look to them. I should have taken a 'before' pic, and if I get one more kit, I'll do so in order to show all the parts on their sprues (trees) prior to any painting. I don't know for certain, but the deluxe kit may have the clear parts pre-tinted, since the War Machines in that version have are pre-painted 'chrome' copper... as you can see on the girl's diorama, they don't utilise a combination of green colours like I did, and appear quite dark. I'm glad you like my 'glowing' effect, which is what I was trying to achieve all along. Now that I've had some time away from the photos and can look at them with fresh eyes, I guess the thickness of the plastic does help make it look so. I've just been looking through other people building of this diorama and found this http://kitbash.net/scifi/Wow/wow.html I particularly like the work on the base. This model maker said "the clear parts on the war machines do not fit to the bodies. Unfortunately I didn't find this out until it was too late." Did you have this problem? I'm off to continue catching up with the 'real life' (non-hobby) stuff, and hope to clear the tumbleweeds from this thread in a week. (Nice visual, that... I picture some dust blowing by, as well, with rotting 'Old West' style buildings in the background. At least vultures aren't circling overhead yet...) Sorry once again! Thanks for the update, hope you're all well now. I'll have to do a little animation of tumbleweed bouncing down an old western street and save it on Photobucket, post it up whenever a thread slows up.